“Bombardier has built a strong relationship with the US Air Force, a Global aircraft operator for four years now. We are delighted that the Air Force has once again selected a Bombardier aircraft to carry out their BACN mission,” said Derek Gilmour, Vice President, Sales, Marketing and Administration, Specialized and Amphibious Aircraft, Bombardier Aerospace. “This recent addition reaffirms the credentials of the Global aircraft platform for special mission applications and we are very proud that Bombardier’s aircraft are serving the United States Air Force,” he continued. As the world’s most advanced ultra long-range business aircraft, the Global 6000 jet is designed and certified to operate at altitudes of up to 51,000 feet (15,545 m)*. 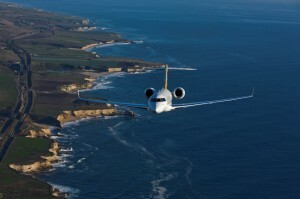 It flies faster, farther, accesses shorter airfields, and climbs quicker than any other business jet in its class. It offers an expansive cabin for equipment and mission personnel, unmatched power generation capacity and higher ground clearance to support sensor installations. In addition, its remarkably damage-tolerant airframe provides superior structural integrity. This entry was posted in Aviation, Bombardier by Phil Dube. Bookmark the permalink.